A longarm quilting business can be used to take quilting to a whole new level. Quilting by the stitch-in-the-ditch method and by stippling can produce some beautiful quilts, but a longarm machine can produce even more exquisite results. For some great information on how to start a machine quilting business, click here! With the invention of the longarm quilting machine, the desire by quilters to own quilting businesses has risen in popularity. The professional longarm quilter is often used to do the actual quilting on a quilt. The pricing for such work depends upon the skill level of the quilter. The purchase of the machine itself can be quite an expense costing $10,000 - $30, 000. 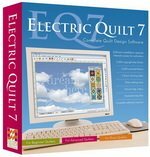 Some quilters may choose to purchase a frame that will attach to and work with their home sewing machine, which can be less expensive at a few hundred to about $1, 000. There are a number of manufacturers that can be used for researching the prospective purchase, such as: A1 Quilting, APQS, Gammill Quilting Machines, Nolting, and Innova, just to name a few. For more manufacturers there is a complete list with links at the Longarm University site. When considering such a large investment, the quilter should definitely be a very experienced quilter or be willingly to take some classes to improve skills and constantly practice to achieve perfection. Other startup costs may include the cost of business licenses, insurance, construction and/or remodeling costs for the area where the machine will reside, since these are machines that are very large in scale. Even with such a large machine area, the quilter should be realistic about the number of quilts that can be completed in a day. One should not overstate what can be accomplished, especially since the size and intricacy of the project will vary. Anyone seriously thinking of either of these two actions should really read these articles, which ask some very pointed questions and give some valuable advice for anyone wanting to enter the profession. Due to the financial outlay and the possibly limited number of quilts that one can produce in a day, the decision to begin this type of business should not be taken lightly.